Everything we do makes a difference. 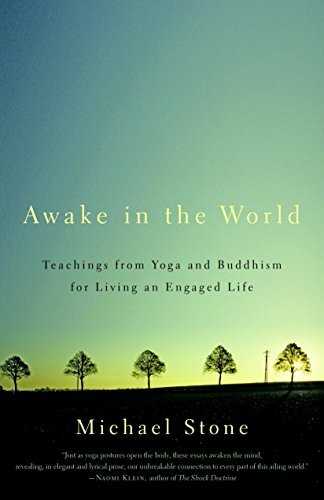 In Awake in the World: Teachings from Yoga and Buddhism for Living an Engaged Life, author Michael Stone says, “The promise of both Buddhism and yoga is to wake up to the inherent connection we all have with everything around us.” As human beings, we alternate between the potential to wake up and the potential to shut down. According to Mr. Stone, this is where some form of spiritual practice helps. It’s also where sangha, or community, helps. This is exactly what many yogis struggle with: how to work with the mental states that naturally and relentlessly arise in daily life. We are challenged by aging bodies, imperfect surroundings, and distracting habits; and we want to tune in to what life’s situations require from us. For this, Mr. Stone encourages formal practices such as meditation and retreat. He also emphasizes constant practice inward and outward, alone and in community with others, so that there is no longer a separation between formal practice and daily life. In Awake in the World, he focuses on these inward and outward practices (niyamas and yamas), the first two limbs of the eight-limbed practice described in Pataljali’s Yoga-Sutras. He also discusses many other topics, drawing on the Heart Sutra, Upanisads, Bhagavad-Gita, Dhammapada, and other ancient and modern works in philosophy and psychology. Notes are included for references made in each chapter. While some readers might benefit from a glossary of Sanskrit terms and concepts, the Sanskrit pronunciation guide is clear. As does practice itself, Awake in the World gradually and deliberately approaches its intention: living an engaged life, in this world, now. This can be done in personal practice, in the yoga sangha, and in the greater community. During the past 100 years, there has been a rapidly increasing “overvaluation” of individualism in western culture; this is associated with personal alienation. Author Stone notes that alienated individuals seek an intensely individualistic spirituality that delivers on “fast-food expectations” . . . this makes community difficult; however, using the practices we undertake, we come to recognize the interdependence among us all. With this recognition, we tend to take better care of ourselves and others, the earth, our cities—and truly live an actively engaged life. Author Stone advocates activism for dealing with the complexities of social justice, economic harmony and environmentalism. He notes, “The Buddha reminds us that we need to move beyond our fantasies of permanence and eternal salvation in some future existence and instead open to the always-changing cascade of life that we call reality,” adding that the path of life’s difficulties leads us to clarity and peace as our inner turmoil ends. In Buddhism, this clarity or awakening is called Nirvana. In yoga it’s called Samadhi. Just as Patanjali taught in his time and place, Mr. Stone maintains that we can employ the products of our practice to respond to the personal and societal struggles in our culture today. Both yoga and activism seem to flourish when they are practiced in community. Yet yoga (nor any) philosophy alone cannot deal adequately with all our contemporary discomforts—a balance comes from putting our personal practice to work in our families and communities while engaging in dialogue with people at the forefront of public issues.